Check back here for news, updates and fun! DNA is the very reason you exist the way you do. It is the backed up files from your family tree with the information on how to make the proteins that make you. Today, DNA can be read, made, downloaded and installed. This concept is what created much of the biotech industry as we know it today. But how do you do this? These past few weeks I have been busy presenting at 2 different maker faires: Randolph and Champlain. Both were fairly small, but very rewarding. I love the idea of a maker faire because you don’t often have that many crazy motivated artists and creators all together in one place. I didn’t have to worry about people not being interested in the project because they were essentially paying money to be inspired by the makers. So, I got to inspire and talk to many people who totally weren’t expecting to learn about biotech. Two of the most disastrous man made forces are nuclear technology and climate change. Check out Zavier's booth at Champlain Maker Faire! We know light can do a lot of different things to matter. It can change the composition and structure of chemical compounds. How does light excite molecules? What can this excitation trigger? What is light bleaching and photodegradation? How could we possibly use these concepts in designing mechanisms for the ray cats? Living things adapt to thrive in their environments. When the environment is high energy radiation, we’ll be able to find living things that are able to survive using unique mechanisms. Changing Colors: Where do we start? Green Fluorescent Protein? Luciferase? Chromatophores? Liquid Crystals? How are we going to get these cats to change color and, in what way? The Raycat Solution is live on Vimeo! Ray Cats on film in Paris! This post is about a month overdue. Time is flying quickly! 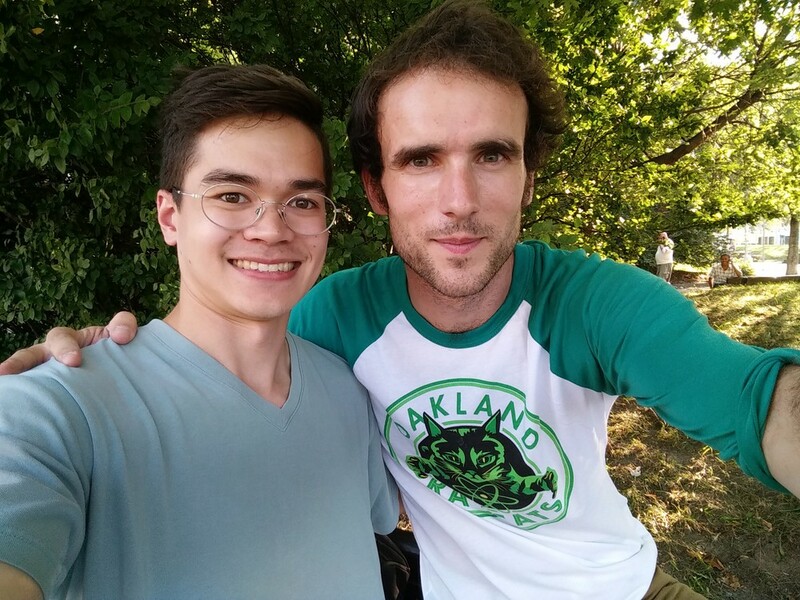 At the end of August, Benjamin, a filmmaker from France, now living in London, came to visit and do some filming. He was on his last stop of a world tour after visiting Paolo Fabbri in Italy and Matt Kielty in NYC. His project was to create a short documentary film about The Ray Cat Solution for the Pariscience Film Festival. So, I picked up a Synbiota RDP kit and got a quick bit of red glowing bacteria going. After a couple days of filming, culturing bacteria and little juggling we put together a great bit of science to be added to the documentary, completing the journey from the philosopher to the journalist and the scientist. Ben's story was really amazing and it was great to hear about Paolo and Matt, and what their impressions were of the project. It turns out Paolo didn't even know about the 99pi episode or that very many people even heard about his idea! Now, we have at least have a first connection between the three of us. As we get closer to rolling out more science/art, we can reach out when we're ready! The stage is set! It is so inspiring to be connected to these people. LINK: Ben has some other amazing projects that you should check out. Things have been moving pretty slow in the Ray Cat world since this project started, since I've been mostly focused on Bricobio's internal affairs. But, we're making some great progress on establishing a space and the organization which you'll hear more about soon! LINK: I leave you for now with an article on glowing turtles that Ben shared with me earlier this week. Update! Worms! Workshops! Lab space! It's been a while since my first post, and I'm happy to say lots of stuff has been happening since last time! We have worms! We got our first batch of wild type C. elegans and are propagating that on a few plates of E. coli OP50. Next, we'll need some reagents to make some more plates and freeze a few of these for long-term storage. We'll be doing workshops! We'll do one in early September and then likely a few more later on. Stay tuned! Lab space! We're aiming to join forces with a few other maker groups in Montreal and rent a big, epic space together starting in September. We are currently gathering equipment and looking for our founding members. If you're interested in helping out, as a volunteer or organizer, please let us know! We need all the help we can get! Welcome to our shiny, new square space site! We'll be using this temporarily, if not permanently, to share news and promote the project. We are hosting an event next Wednesday at the Notman house in Montreal and encourage everyone to come out! The event is part journal club, part project launch. There'll be strudel and we'll be talking about whales. Come out for some interesting discussion! Apologies for the lack of content on the initial setup. Expect A LOT more coming soon!